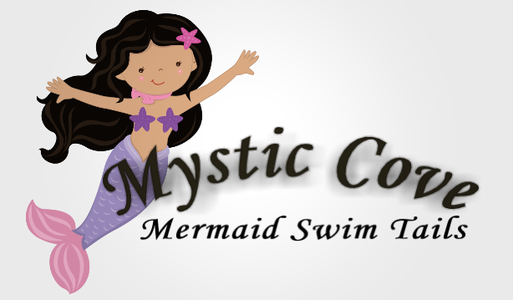 All about Mystic Cove mermaid tails! Mystic Cove Mermaid tails are available in a variety of bright sparkly fabrics and are fun for swimming, dress-up, or bathtub play. The tails are left partly open at the bottom to allow mermaids to walk or for easy insertion of a monofin. The waist is elastic and side seams are serged for stretch and strength. Fabric is nylon-spandex. All fabrics will wear with abrasion and with chlorine and sun exposure, but I try to choose only fabrics that will wear well. I test and reject many fabrics that won't hold up to normal use. Tails are partially open at the bottom. Please consult the size chart before ordering as sizes may not be true-to-size. The fabric will stretch in the water, so it is best not to size up. Don't worry--the stretchy fabric provides some room to grow! I personally make each tail and am happy to customize sizing. Just leave a note on your order with measurements! Adult Supervision is absolutely necessary for swimming in mermaid tails! It is more difficult to swim with your legs together, so swimming in deep water is for strong swimmers only. 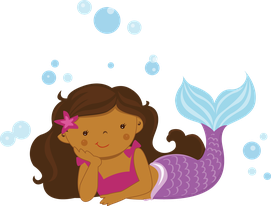 Little mermaids should stick to very shallow water or land play. Please responsibly protect your precious mermaid while she swims!! A Mystic Cove Mermaid Tail may be used with or without a monofin. Use of the tail without a monofin allows for walking in the tail. A monofin will make the tail stiff and more realistic and will allow the swimmer to propel themselves through the water more easily. Children should be strong swimmers before swimming with a monofin. Body Glove, Finis, and Fin Fun monofins will all fit and are available through amazon.com (links below). 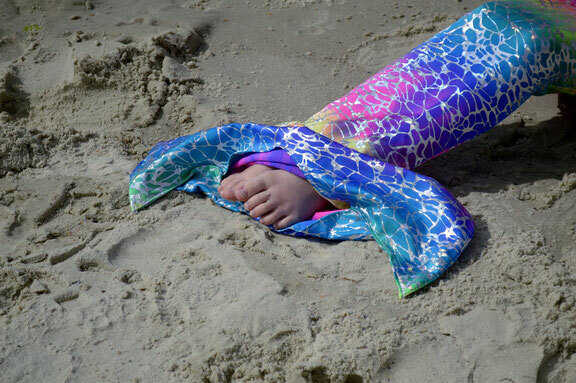 Mermaid tails are made from swimsuit fabric. They can be snagged or wear prematurely when rubbed on concrete. To keep your tail looking its best, do not walk on the tail and treat it with care. Rinse your tail out after use and dry in the shade to minimize chlorine and sun damage.